Gases play key roles in the research, development, growing and processing of food-products. You need gases in a wide variety of systems and processes ranging from greenhouse growing, cryogenic freezing and chilling systems, stunning, pre-chilling, quick freezing, aeration, CO2 snowing and modified atmosphere packaging. The right gases delivered through the right distribution systems help you keep up with production demands while maintaining the quality, taste, texture, moisture levels and safety of various products. Oxygen helps prevent yield loss while maintaining pond population density and fish health in smaller ponds. Increase aeration to enhance growth rates and fish density. Modified Atmosphere Packaging (MAP) is a way of extending the shelf life of fresh food products. This is achieved by replacing atmospheric air inside a package with a protective gas mix. Deliver faster heat-transfer to preserve quality, texture and taste of beef and pork with minimal weight loss. Maintain cryogenic meat mixing systems to slow bacterial growth and assure uniformity of temperature. Maintain uniform temperatures to obtain accurate and repeatable results with patties and other formed products. Provide high-quality taste and texture in fruits and vegetables while minimizing spoilage and waste. Lock-in natural moisture and reduce bacterial growth in seafood. Maintain flour and dough cooling systems to achieve the desired temperature. 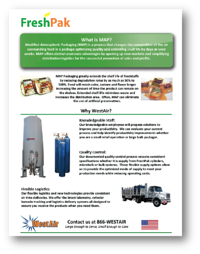 Supply specialty gas blends for Food Packaging including dosing and MAP applications. Provide carbonation for alcoholic and non-alcoholic beverages. You need reliable sources N2 (nitrogen) O2 (oxygen) and CO2 (carbon dioxide) to support a wide variety of key processes. Your gases must comply with a variety of quality standards including GMP (Good Manufacturing Practices) and the FDA. WestAir delivers what you need, where you need it. (N2) plays important roles in maintaining process quality. You need nitrogen as a cryogenic agent in cooling, chilling and immersion freezing. N2 plays a key role in reducing spoilage, discoloration and off-flavors in beef and pork as well as baked goods. N2 gives strength to retail packaging. Nitrogen prevents oxidation in the package headspace of still beverages, pressurizes bottled water packaging and helps dispense draught beer. CO2 plays a key role in cooling, chilling and freezing applications, protecting the taste and texture of food products by maintaining proper temperature control. CO2 helps remove heat at any stage of food processing via snowing. CO2 increases shelf life of juice and dairy products, reducing the need for preservatives while protecting taste and texture. Without carbon dioxide, you wouldn’t have carbonated beverages. And, a CO2 controlled-atmosphere stunning system plays a key role in the humane treatment of turkeys and broilers. Food wastewater streams use oxygen (O2) for enhanced aeration and aerobic digestion. The aquaculture industry uses oxygen to deliver the dissolved oxygen levels needed for high production-levels and fish health. To extend its shelf life, preserve its freshness and to avoid losses due to staling or spoiling, modified atmosphere packaging (MAP) gases replace the natural atmosphere in packaging. You want to focus your attention on research, development, scaling-up, and production - not worrying about having the right gases, equipment and safety products where and when you need them. With WestAir, you also have access to a team of gas and safety experts to help you analyze your needs and provide training.